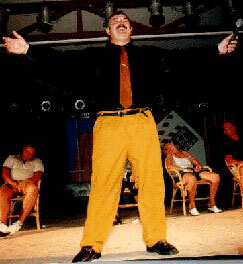 The Top comedy stage hypnotist show, by Adam Night. Entertainer extraordinaire! Hypnosis this unique Hypnotist show is suitable for corporate functions, theatres, wedding receptions,parties and cabaret nights plus a variety of smaller venues. All shows are fully insured. Adam tailor-makes every show to get the best out of his volunteers and entertain his audience. Mild mannered friends become Madonna or Robbie Williams, they get transported to the hot sunny beaches of the mediterranean, or they may find themselves riding the favourite in the worlds greatest horse race. "This is not a magic show, It far surpasses the boundaries of magic." This show enters a whole new level of fun as mentalist, Adam Night, experiments in many areas of the paranormal and mind control. It is not education - it is strictly light hearted entertainment. Adam engages the audience whilst they witness things that seem impossible right in front of their eyes! Ah-ha! sorry on this one!... It's his job is to make people ask this question, not to answer it! ADAM NIGHT HAS BEEN DESCRIBED AS POSSIBLY THE WORLD'S MOST UNIQUE ENTERTAINER.